The weather was too challenging for us to get to our field site for a few days which was frustrating as we were all set to go. On the plus side it’s not often I get to celebrate a birthday in Antarctica – or Italy – and a few days ago I sort of managed both! Dinner was followed by a huge cake, champagne, happy birthday in two languages and then a lesson in table soccer. We did have some modest scientific achievement in that we recovered four dust traps for a research team at Victoria University. The dust traps are designed to capture wind blown material to determine the rate of injection of this material into the nearby ice and ocean. This same wind is also responsible for driving the massive cooling effect that causes the Terra Nova Bay polynya. This recovery involved flying out to the Nansen Ice Sheet and Hell’s Gate — serious pieces of ice ten minutes helicopter ride south of here. It was rather exciting actually standing on the type of ice that it driving lots of the processes we are studying. Huge seams of sediment, melt ponds and even rivulets of running water combine at a massive scale. And this is just what you can see — beneath it all lies the ocean. The next day’s waiting for weather involved a helicopter flight to within 5 km of the field site before we turned back by a wall of cloud over our field camp. This brought home to us how localised the good and bad weather can be around here. Finally, proving that patience is a huge virtue with Antarctic weather, we had a windless, sunny day at the camp and captured a serious amount of data. We took full advantage of the opportunity and had the equipment running pretty continuously through the day. It’s not a full tidal cycle but it is a substantial part of one. Our main profiler is a Canadian-built instrument that can measure temperature and salinity down at perhaps the cm scale and to hundredths of degree accuracy. It also captures to tiny velocity variations in the ocean that act to stir up material and also represent energy lost from the main ocean currents. Equipment this sophisticated is rather delicate and needs a good deal of care and attention to detail to keep it running. However, give the harshness of the journey and conditions with which it must deal it’s a miracle it works at all, let alone consistently for hours on end. The profile data show a myriad of slowly changing layers in the top 50 or so meters, sitting above a core fluid that remained pretty consistent in terms of its constituents. Just below the ice, the seawater was cooled down to near-freezing and suggested a pretty stable situation with regard to the condition and survival of this sea ice in the remainder of the season. Deeper, near the base of our profile at around 300 m depth (we can’t get right to the seafloor here as we couldn’t fly in a big enough winch) there was another layer with a clear signature that looks like it might have come from the nearby polynya — although with the warm weather the polynya itself is not obviously active. This we will need to tease apart when other data from other sources like ships and satellites come in. We were able to get out to the field camp again the following afternoon for some follow-up profiles to provide us with a comparison. Things had changed dramatically in the top 50 m and now there was a warm fresh layer that had slid in just beneath the ice and was almost certainly causing melting. Also, with this change came a good deal more turbulence in the upper part of the ocean. If we can get out in the next day or two we hope to confirm the persistence of this warm layer, because if it remains it will have a dramatic effect on the sea ice structure. A couple of emperor penguins came visiting during this most recent field day. They seemed a little less curious than previous encounters we’ve had as they didn’t come too close to camp. Other than that there have been a seal or two visiting the hydro-hole but nothing too disruptive. There are plenty of other holes in the area so I think they quickly decide they don’t need to share the space with oceanographic instruments. Also the bird life has a little more variety — i.e. more than just skua. It is always tricky drawing global conclusions from such local finescale (— both in terms of duration and spatial extent) observations. However, the results give us a new perspective of some of the oceanographic processes in a basically unsampled bit of the ocean and give us a bit more certainty as to how to build ocean models. A quick look at the marine chart for the Victoria Land coast along the western Ross Sea shows a myriad of glacier tongues all jutting out into the ocean to varying degrees. While the Drygalski is far and away the biggest glacier tongue, they all certainly influence the local circulation. This in turn plays roles in regional aspects of both climate and ecosystem processes in what is a rather important part of the ocean (i.e. cold salty water for ocean thermohaline circulaton and sea ice for habitat for algae that starts a massive food chain). 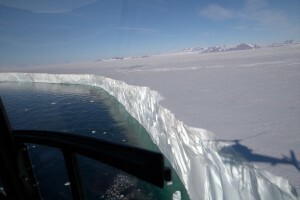 Our new data give us some clues with regard to the way layers of ocean water collect and build up along the sidewall of the glacier. Also by sampling so late in the summer season we’re seeing some of the warmer waters and how they bathe the underside of the sea ice — reducing its resilience.